Serving up a smorgasbord of speaker simulations, MixChecker Pro is a genuinely useful playback referencing tool. Mono switching and Auto mode. Inevitably influenced by your actual playback system. Interface has a few annoyances. 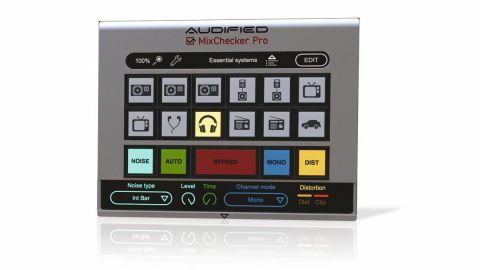 A more advanced version of its MixChecker plugin effect, Audified’s MixChecker Pro (VST/AU/AAX) simulates a wide range of playback speaker systems for auditioning purposes, from studio monitors, hi-fis and headphones, to car stereos, phones, tablets and TVs. It improves on its sibling with many more convolution-based speaker sims, nonlinear (as well as linear) modelling and much higher quality algorithms, and a degree of customisation. Each of the 12 main buttons houses a speaker model - click a button to audition your mix through that model. There are 62 models in all (the original MixChecker has just 12), across 12 categories (Studio Monitor, LiveSound/PA, inEar, onEar, Radio, etc), so Audified has clearly gone out of its way to cover as many bases as possible this time round. While MixChecker allows no modification of... well, anything, MixChecker Pro lets you freely assign models to the 12 buttons and rename them, move buttons around, and tweak each model in terms of Stereo Base (all the way down to mono), device-modelled Distortion level (see Noises off) and Volume offset. The whole ‘Button Set’ can be saved as a preset (five are included), so you could have one preset for all your target hi-fi systems, say, another for a range of phones and tablets, another for headphones, another for in-car audio, etc. At the bottom of the interface are five global function buttons (including Bypass) and a pop-down panel containing controls for a couple of them. Activating Distortion simulates the distortion generated by the current device as if the input signal was arriving at the SPL set using the Distortion slider in Edit mode. Noise mixes one of 14 sampled real-world ambience noise loops in - Street, Park, Mall, Subway, etc - for ‘environmental’ auditioning. The Noise level is adjustable down to -30dB, and, crucially, it’s appropriately filtered when used with the headphone models. The Mono button switches the output to monophonic, based on the left or right channel, or both, or swaps left and right, depending on the setting in the Channel Mode menu. Lastly, clicking Auto sets the plugin cycling through the 12 loaded models at a step rate of 1-12 seconds, as set by the Time knob. The generic, uneditable device icons are irritating, though (why can’t we import JPEGs? ), as is having the name of each device only show up as a tooltip when moused over, rather than simply printed in abbreviated form under the icon. Load up your preset bank of PA systems, for example, and you’re looking at a series of identical, unlabelled buttons. Various global functions are on hand for adding environmental noise, distortion and more - see Noises off - and the free MixChecker RC iOS/Android remote control app works well, duplicating most of the UI on a wirelessly connected phone or tablet. The Compensation feature from MixChecker, which counters the amount by which listening through headphones or small speakers affects the simulation, has been dropped - apparently because there are too many variables between systems to cater to. A calibration system is apparently in the works, but what it ultimately means for now is that MixChecker Pro requires high-quality monitors to work effectively. And even with that requirement met, of course, the frequency response of your particular speakers will inevitably exert an influence on the sound, so those virtual Yamaha NS10’s can’t ever sound exactly like the real thing. The question, therefore, is: does it matter that MixChecker Pro can’t 100% nail the sounds of the setups it simulates, thanks to those unmanageable variances? We’d say it doesn’t, no, as with even a half-decent playback system, you certainly get a reliable enough impression of how a track will come across on a wide range of speakers to inform those crucial broad-strokes mixing decisions. As long as it’s employed in that spirit and you know how to address the sonic issues it’s designed to raise, this clever, easy-to-use plugin really can help you improve the universality of your mixes.